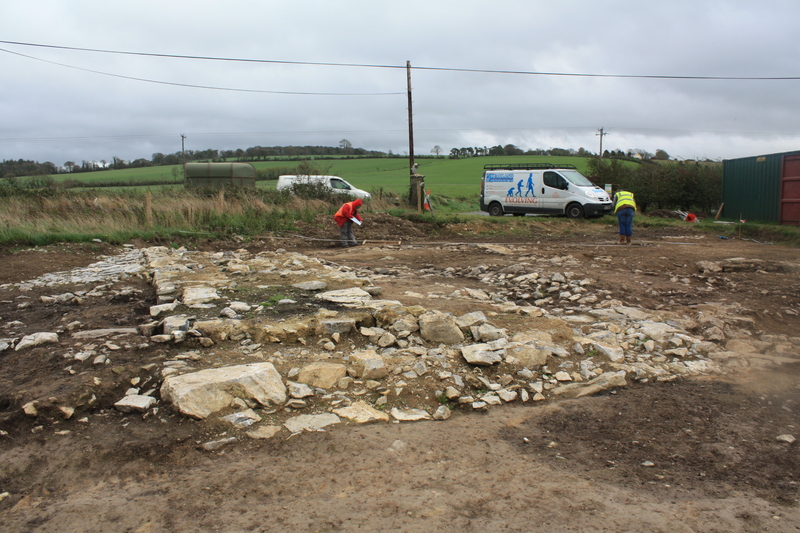 In October of 2011, an archaeological survey of a site slated for future road construction near Doneraile, County Cork, Ireland, uncovered the foundations of Caherduggan Castle and its moat. This was a medieval stone castle built by Anglo-Normans next to an early medieval ringfort occupied between 400 and 1169 A.D. by local chieftains of the Duggan family (hence Caherduggan which means “the fort of the Duggans”). The castle was built in tower house style, a stone tower on 40 x 80-foot base with walls more than six feet thick. It was demolished somewhere around the middle of the 19th century and much of the stone was taken away to be reused in new construction leaving behind only the foundations. The defensive moat around it was deep and had been filled with soil, discarded pottery and animal bones by the 17th century, but the archaeological team from Rubicon Heritage Services were delighted to find that the lower levels were waterlogged, creating an anaerobic environment ideal for the preservation of organic materials like wood and leather. 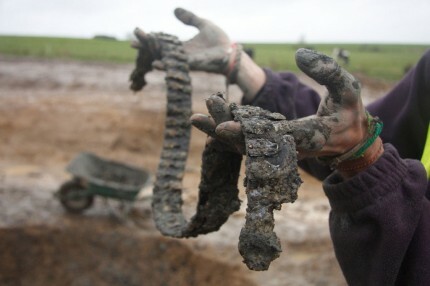 Indeed, within a week the moat turned up its first leather artifact: a 600-year-old woman’s shoe. Behind the moat they found another blessedly waterlogged area. Archaeologists found it was a deep well, dug down below the water table. The lower levels were still extremely wet and the team immediately encountered large numbers of wood fragments and some fragments of leather preserved by the low oxygen environment. Then they hit paydirt. On November 30th, 2011, archaeologists discovered a leather belt complete with buckles on both ends and covered with metal studs. Such an elaborate leather piece is a very rare survival. 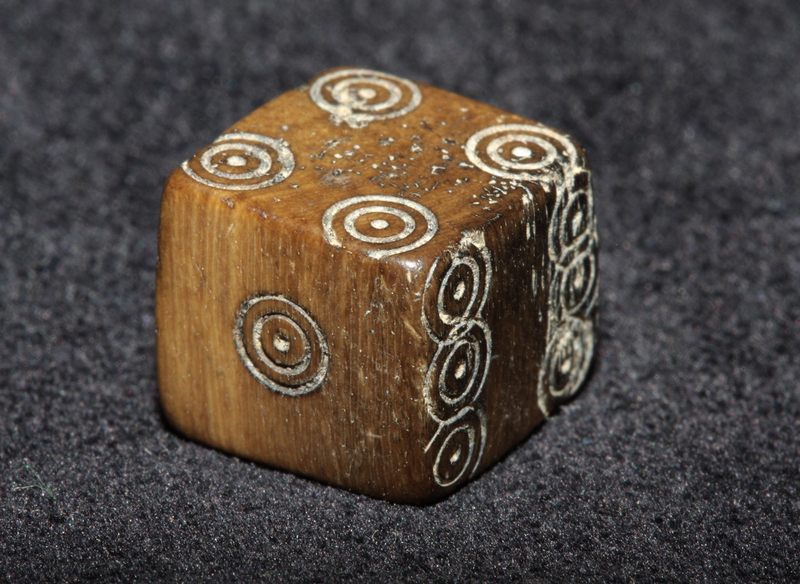 In short order the belt was followed by a pair of leather shoes for indoor use and a bone gaming die in pristine condition. Unlike modern dice, the numbers on the faces (represented by concentric circles) are sequential, one and two are on opposite sides, then three and four, then five and six. The die, shoes and belt all date to approximately the same era, the 13th or 14th century. After months of conservation, the leather studded belt revealed itself to be something even more precious than anyone realized. Almost three feet long, the belt was not for human waists but for horse chests. It’s a peytrel, also known as a breast-collar, the part of a harness that connects the saddle to the breast plate. The studs aren’t studs, they’re a group of 36 gilt copper-alloy heraldic shields decorated with lions counter-rampant (meaning they face to the viewer’s right). Each pendant is connected by a hinge to a fixed mount that also bears the counter-rampant lions. The hinges ensured the pendants would move prettily when the horse was in motion. At each end of the strap are gilt copper-alloy buckles. They were recycled, cut off another piece and attached to the ends of the peytrel so that it could be attached to harness fittings on the saddle and breast plate. They were too valuable to discard once whatever they were previously attached to wore out, and the peytrel with all its pendants was of course even more valuable. However it ended up down that well, it’s unlikely to have been deliberately thrown away. The counter-rampant lions may help answer some questions. It’s an extremely rare design. The Office of the Chief Herald in Ireland is looking into possible associations, but they may have simply been a decorative choice rather than a nobleman’s arms. Not just in Ireland. Thousands of medieval heraldic pendants from harnesses have been found in Britain in Ireland, but they were the only part to survive. This is the only peytrel we know of that has survived with every part, including the leather, intact. That makes this a discovery of international significance, a museum quality piece that is one of the greatest secular medieval leather objects ever discovered in Ireland. This entry was posted on Friday, July 12th, 2013 at 11:52 PM	and is filed under Medieval, Treasures. You can follow any responses to this entry through the RSS 2.0 feed. You can skip to the end and leave a response. Pinging is currently not allowed. What a brilliant discovery. I hope it turns out to have belonged to a Medieval Knight. The pictures are fantastic Thank you. You’re very welcome. I hope the heraldry experts figure out exactly who it may have belonged to and then find an ancient manuscript with an illuminated image of the knight on his horse with the peytrel in action. Dream big, right? How do they know that the buckles were recycled? The edges have marks where they were detached from their previous iteration, I believe. I’ve emailed the company to find out for sure. It is very beautiful. The craftsmanship is superb! I am happy when medieval items are found. I am too, especially when they’re organic artifacts that rarely survive. One sees now why harness shields are as common as they are on eBay. “Conservation” looks a bit thorough-going, doesn’t it? You think they’ve overworked the original? It looks like it was just cleaned to me. Fantastic find! I love hearing about things like this! Me too! I’ve seen the pendants before but it’s so neat to see them attached to their mounts and, most amazingly, to the leather itself. Amazing. When I read stuff like this, I feel bad for Americans like me, who can’t find too many things as old as this. Amen, brother. The difference between the US Antiques Roadshow and the British one is night and day when it comes to the ages of things. Great Pix as always. Incredible! It always makes me wonder, when things like this are discovered, when you think the land is just too torn apart and paved over by contemporary living to find anything of interest, what things we can’t even fathom will be found in the future. I think a lot about that. Wherever I go, I wonder what’s under my feet. Hi, I’ve already been a lurker all around your blog for a couple of months. I love this article and your entire site! Looking forward to looking at more! Huzzah! Every time a lurker posts, an angel gets its wings. Thank you for piping up and enjoy your reading. Now I’m really glad I took the time to catch up on my RSS feed after vacation. This is great! I like to imagine a small child, upset at having been scolded by a knight or lord, filching this from his tack and sneaking away to toss it into the midden with a wide, grinchy grin. I love that idea! Certainly the knight wouldn’t deliberately throw away his own expensive and beautiful harness. My 11th great-grandparents lived and died there in the 16th century – so exciting to come across this blog! They lived in Doneraile? How cool that you’ve been able to trace your ancestry to the 16th century! Actually my father did the research, more than 20 years ago, pre- internet. Ion and Barbara Grove lived and died in the castle, not just in Doneraile. They had ten children. I just happened to be talking about tracing family trees yesterday, and had to google name of castle. That is how I came across the blog, had no idea about excavation etc. What is wonderful is making history come alive, like these finds do.